Pennsylvania leads the nation in under-30 voter registration, according to a new voter data from Democratic analytics firm TargetSmart, and Billy Penn reports this cohort now outnumbers voters over 64 statewide. Statewide, the share of new voters under 30 (the cut-off TargetSmart chose) increased by 16 percent — more than anywhere in the country. Youth in Allegheny County and Philadelphia helped drive that increase, but rural counties like Clarion, Juniata, and Westmoreland saw big jumps as well." Democrats have been the net winners from these registration gains overall, widening their registration advantage over Republicans to about 814,000 voters. Colin Deppen and Sarah Anne Hughes credit some of the registration campaigns by groups like Inspire and NextGen that are underway on college campuses across Pennsylvania for the youth registration surge heading into the 2018 midterms. Another likely reason is the ease of registering to vote online in PA as a result of the Wolf administration's roll-out of Online Voter Registration almost exactly three years ago in August of 2015. As of February 2018, over 1 million people had used the service. This has made it easier for all residents to register to vote, or update their voter information, and it makes some sense that digital natives would be most drawn to this method of registering. Further advances like same-day registration and of course automatic voter registration would go even further to reduce obstacles to voting and likely increase participation by less frequent voters, who tend to be younger. 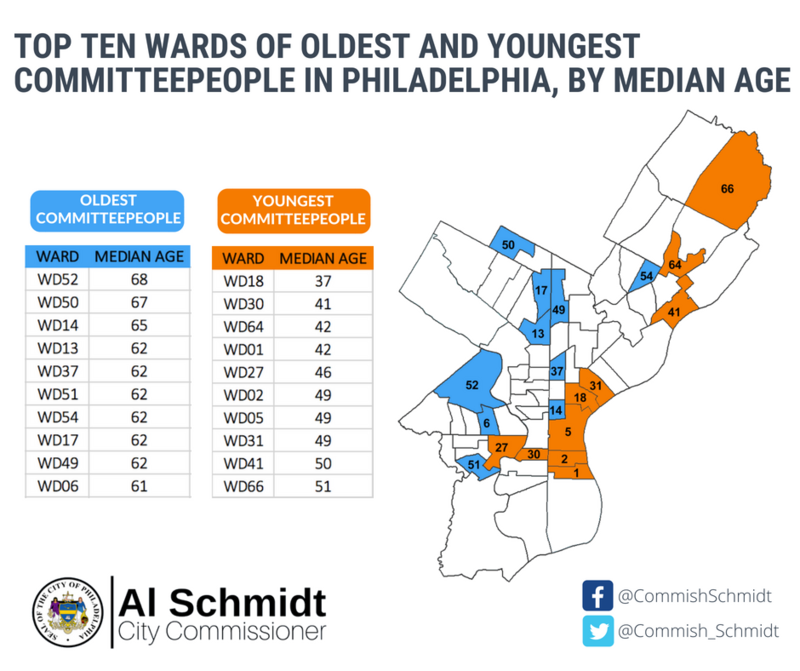 We'll be interested to see how the registration increase breaks down by ward in Philadelphia, though it seems like a safe bet the increases correspond to the areas with the youngest average age of committee people. 18th Ward committee person Ruokai Chen analyzed the demographic breakdown of the 2018 Democratic committee people a few weeks ago, and this week City Commissioner Al Schmidt published some infographics with the age breakdown for all committee people, both Democratic and Republican. The age breakdown is pretty similar, although including Republicans in the mix definitely increases the percentage on the older end of the age spectrum. Whether we look at the combined population of committee people or just the Democrats though, it's clear that party activism attracts a generally older cohort. 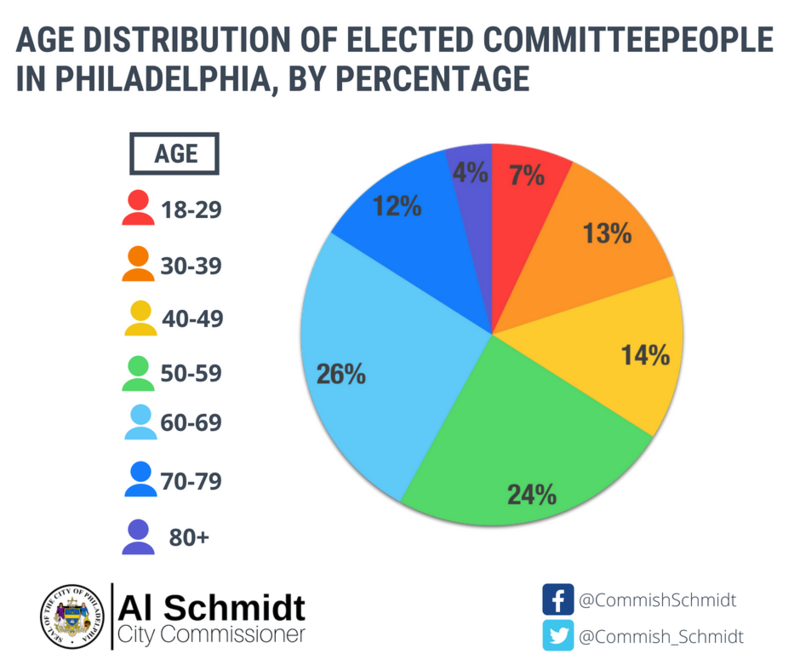 Only about 34% of the city's committee people are under 50 years old, and 66% are older than that. Fully 42% of all committee people are over 60 years old. For context, under-35 voters make up about 24% of registrations and about 30% of the city's population. The 2018 election saw big increases in Gen X and Millennial committee people, particularly in Center City, eastern South Philly, and a few of the Northeast wards, which, not coincidentally, are the areas seeing the largest influx of younger residents. It seems unlikely that the generational make-up of City Committee will ever perfectly reflect the generational make-up of the population or the electorate, but the 2018 primary shows it's possible to get a lot closer to demographic representation when there are more active efforts to contest party elections.